Experience your own slice of paradise at the exotic and spacious private Tuscan Villa in the Hollywood Hills. Wake up in the morning with birds chirping, open the curtains and appreciate the panoramic views of the City. Enjoy your morning coffee on the patio by the waterfall pool and have your breakfast with family & friends in the nook. Go for a jog at Griffith Park next door and visit the Griffith Observatory. Experience being a tourist by taking the metro (walking distance) to the Hollywood Walk of Fame, Universal Studios or Downtown LA, all within 10-15 minutes driving distance from the Villa. Come back home from an eventful day, turn on the fireplace and prepare to BBQ outdoors or cook a family style dinner in the gourmet kitchen. End the night with your favorite wine by the pool relaxing in the warm Jacuzzi/spa. Experience living in Hollywood like a Celebrity where many others have stayed(VIP's, Oscar winners, Grammy winners, Pro-ball players, and etc...). * The Tuscan Hollywood Villa is privately gated property and is tucked in a quiet neighborhood in the Los Feliz hills with 24 hour security patrol in the area. It is a fully furnished gated property with panoramic views of the City & Downtown LA. It offers 4 bedrooms with a loft and 3 1/2 bathrooms. One bedroom is located on the first level for guest with difficulty with stairs and the loft can be used as an office or an additional sleeping quarters, if needed. The Villa offers Spa/Jacuzzi , Waterfall Pool, gourmet kitchen, patio, front yard & backyard. The Villa is well maintained with Pool man, Gardener. It is equipped with a security alarm system, has 2 Fireplaces, central Heat & Air, Satellite TV, WI-FI, flat screen TVs, CD/DVD Players, Washer & Dryer, Private Pool, BBQ, Outdoor Dining in front and back yard. 24 Hour patrol security. Gourmet kitchen w/ Microwave, Dishwasher, Refrigerator, Ice Maker, All cooking utensils and linens are provided. 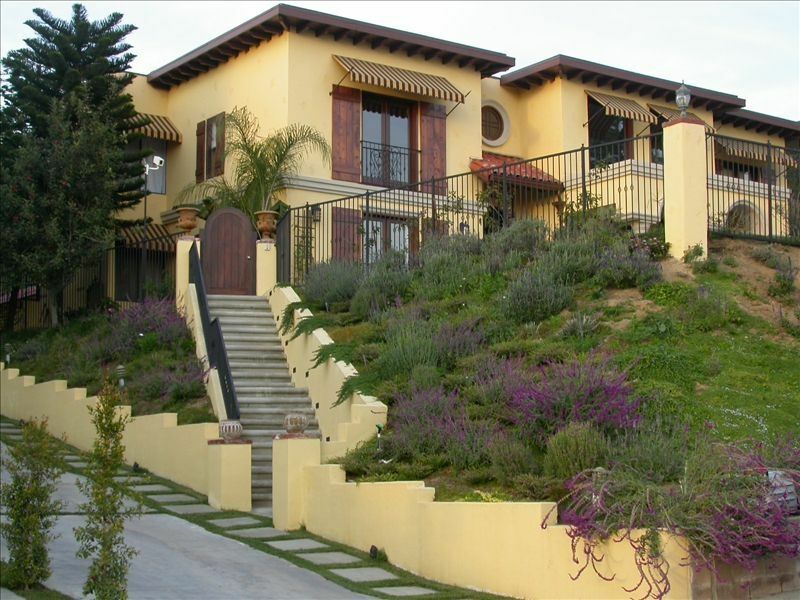 *Gated hillside property, full view of Downtown L.A. all the way to the ocean on clear days. Rates are subject to change based on availability & holidays. Taxes not included. CLOSE BY: * Very close to Universal Studios, Hollywood walk of Fame, Griffith Park and Observatory, Greek Theatre, Pantages Theater, Kodak Theater, Chinese Theater, L.A. Zoo, Scientology Center, Downtown, Staple Center, U.S.C., West Hollywood, Beverly Hills, Santa Monica Beach and Pier. Shopping, dining, outdoor activities and sightseeing are all easily accessible. My family and I spent an extended weekend (End of March 2019) at this amazing property The views of city from the house and the backyard were breathtaking. The house was great for entertaining, well decorated and very spacious with 4 bedrooms all with comfortable beds. The owner Pascal was a great host and communicated well from beginning to end. Beautiful home with a view to match. Unforgettable home and view. Pascal’s home is a great home to entertain a group looking to get away. We enjoyed the view morning, day, and night. We liked Pascal’s home for its location as well. Though the home feels far removed, it is a short drive to lots of popular sites. It was amazing. We Thank everyone involved. Great location and magnificent views from what has been a very nice villa. Villa seems not to be in regular use by the owners and is somewhat neglected falling apart from here and there. Had a great week there regardless. Truly stop you in your tracks and just oogle at the view - it's LaLaLand! The house is excellent for a family that wants to spread out and have their own spaces (kids, 16 & 20) and share excellent common areas - the outdoor patio and pool!, living room, dining room, family room. Home located in one of the best neighborhoods in LA - everything is close - there's too much to do! Hiking, fantastic restaurants, excellent shopping. Great location and a stunning property adjacent to Griffith Park. Decor is a little dated and worn but it is clean and everything works. We loved it.